The standard economy kitchen taps didn't cut it. However, I didn't want to order or plan a trip to the dollhouse store to get new taps. Or go to Michael's because of the thousands of beads and findings I have didn't match the ones from the tap tutorials I found. Because nothing goes as planned. It was 11:30pm. I should have been in bed. Instead I was mucking about at the work bench when I literally glanced up at the neat clear box marked "Wire Management/Non-Skid Item." Yes, I have a label maker and I enjoy using it to label and organize everything. There they were, my wire clips! I thought, taps! While this may have been sleeplessness talking, it actually worked. And I still like them a month out. Google the above for the image. You have them in your house. Likely, you have some in a drawer. Or head to the hardware store. First, I am sorry for not taking pictures of the raw materials. And Picasa is a pain to upload to every time I want to add something. So please tolerate my overly wordy descriptions. Take 2 of the medium/large cable clips. You choose the size that best works with your scale. They're cheap, so buying a box or 2 wont break the bank. Clip 1 will have part of the arch cut off for the tip of the faucet (see above). It's where the "water" will come out. Clip 2 is for added height at the base of the faucet. Not necessary, but a single clip seemed too low to get your hands under to wash. You can see the seam in the above picture where I cut through the clip where the nail goes through. It maybe added 2mm in height, but I liked it. Remove the nail when you cut! You will need a longer nail now to drive through both pieces and into the wood. A finishing nail should work just fine. Take 2 of the tiny clips (I think this size is for telephone wire). Cut off the arch at the middle of the clip to form a handle. 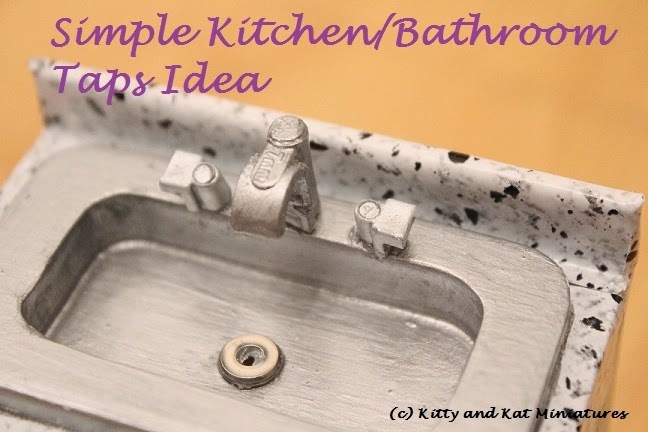 Drill your tiny holes for the taps nails to go into. Don't try to just hammer them in without drilling. You will destroy the taps and hammer your fingers. Then gently tap the nails through the cable clips. Drill the holes slightly larger then needed. I added some glue on the nail to ensure it held tight, and the larger hole prevented damage to the sink. Paint the plastic with a medium grey paint and then add a coat of silver to get stainless steel. I then top coated with Mod Podge to seal the paint. I had actually painted them before I nailed them in. Didn't work very well. As I tapped it in, the paint cracked and flaked. So I had to start again with the paint. You're thinking, what the %$*@! Why hasn't this woman posted anything about a kitchen and then, bam! 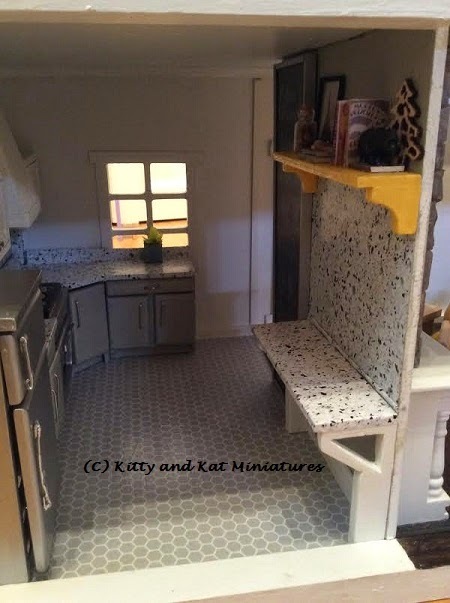 there is a 90% complete kitchen in the house? Well, I delayed writing to finish the cabinets. Then life got more then crazy and I was too tired to write. And finally, after being mentally able to write, I didn't have access to the computer to edit photos and write. It is actually even more "finished" then in the picture but I didn't update the photos. The kitchen gave me a headache. The extra door and the window made it really difficult to place my kitchen cabinets. Mind you, I bought them last year before really getting into this hobby. I would have purchased the Houseworks set instead. But, hindsight is 20/20. So I closed off the door in the kitchen. Boom! Problem solved. I used plywood and glue on the exterior. Then I used white card stock on the interior and sealed the door off. I used LePage's No More Nails as my glue and filled the gaps around the card stock with it. I sanded away the extra glue and got a great finish. Mind you, it was 90% hidden in the end, but I liked the look. The white walls are painted CIL Eggshell "Romance." Other then when the camera flash lights the room, you really don't see the seams of the card stock. The fridge was white. I wanted stainless steel, along with the stove. I used 2 coats of a medium grey to base coat and followed it up with 4 thin coats of silver. The silver is merely a top coat with next to no coverage so you need the grey coat to make it look like stainless steel. The stove had little brass handles/knobs on the front. Didn't like it. So, I made knobs on the top with small beads and a nail. Genius here realized when editing photos that she didn't put on a knob for the stove on the front. I corrected this and made my own digital display (painted of course) and a Wolf stove logo too. I'll post that later on the finale. I also printed a Sub Zero logo for my fridge! I used metal from tea lights to make new handles. I folded it several times to make it thicker and then used small brads to nail it to the fridge. It works for Miss Kitty. It looked good before she smashed them flat. The metal isn't thick enough to hold its shape. Meh. You live you learn. The cabinets started off white. A bit too white. Then I thought, why make the tops and bottoms match? So many things to think about. I notched all the base cabinets to fit around the little bump out along the floor. Very easily done with my coping saw. I then primed them with Zinsser 1-2-3 primer and painted them with some Martha Stewart eggshell paint I had laying around. I chose shelf lining paper for the counters. I had even bought the pastel pencils and was ready to make a faux marble counter. Then I stopped and asked myself, are you crazy? Leave that for the next dollhouse. I went to Walmart and found Contact Paper brand faux granite shelf liner. I used the black and grey look, but also bought the beige and grey version because I wasn't sure which one I wanted. I had tried the dollar store version of faux marble. Very nice looking, but really tough to work with. Spend the money, it is just a better product for $7. And you have a giant roll of it for future projects or shelf lining. As you can see from the 2 above pictures, the contact paper was simply placed on the counter. HA! If it was only that easy. I wanted to glue it to ensure it would never peel up. After all, contact paper by nature is removable. I cut approximate sizes and did a test run before I glued. I definitely used my little plastic ruler to help press it into creases and my knife to trim as I went. The best thing about this faux granite is that you can work in pieces and not see seams because of the pattern. I am so very picky and I did not see any cut seams. Because if I had that's all I would have fixated on. DO NOT use a heavy duty adhesive like Quick Grip glue. The paper bubbles and ripples on the large stretches. 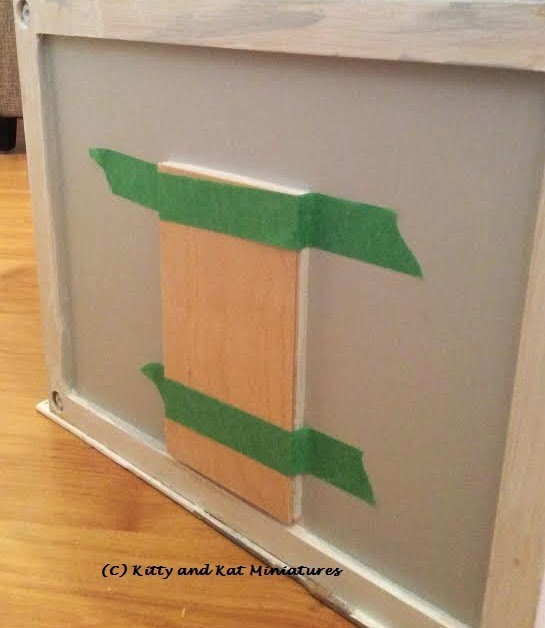 Use wood glue or regular white glue. I did use Quick Grip on the edges that could not be seen to prevent any possibility of roll up. I glued the 2 counter sections above together since they butted up to each other and put the paper on as 1 solid piece. For the backsplash I was torn. I started cutting tiny white subway tiles from card stock. Then I stopped. Hello!! You have contact paper, so why make life harder? All it took was a little forethought in setting out how high I wanted my upper cabinets. Then I cut a strip of contact paper and stuck it down. I didn't use glue for this area. Instead, both the upper and lower cabinets adhered to it, so the edges were sealed. I made a floor to ceiling chalkboard for the kitchen. I actually would love one in my kitchen, so I made it mini instead! I will post about that project later. I made the shelf and the brackets from pieces of balsa. I hate balsa. It is so easy to cut but I hate the finish and how careful you have to be. I'm counting the minutes until I get a scroll saw so I can use better wood without cutting off my fingers to get the cuts I want. I used a few printies to make the cookbooks (see my Pinterest page). The tree was a little Christmas do-dad from Target. The Eiffel Tower picture is from scrapbook paper. The Beans teapot sign is blue and lacquered. The glass jar is filled with mini corks, an ode to my personal collection. 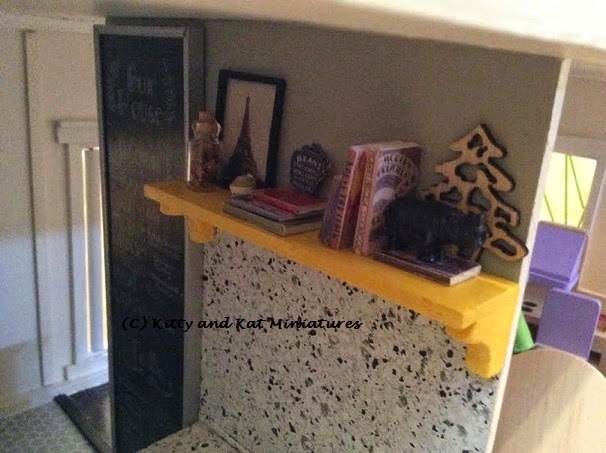 And the rhino bookend is a bead that I used caulking to fill the holes in and spray painted matte black. With all the grey and black in the room I chose bright yellow as my accent. It will appear in later pictures on the drapes, small appliances and frames. I thought it might be a little too tight to add in a table and chairs, so I opted to make a breakfast bar area. The counter is set at "bar" height, 36". Which is actually the height of my kitchen cabinets. I think the cabinets seem a bit high. Oh well. I made the brackets from balsa and painted them CIL "Romance." I took the granite contact paper all the way to the shelf for some visual interest. I added in some baseboard and my little vent. Gotta have good air flow. I promise to try and write more. Above the bathroom toilet I needed art. I have been painting pictures and framing them, but I didn't want a painted picture. I recalled some neat toilet paper roll art I had seen on Pinterest. They slice toilet paper rolls into circles and crimp an end to make them into a point. 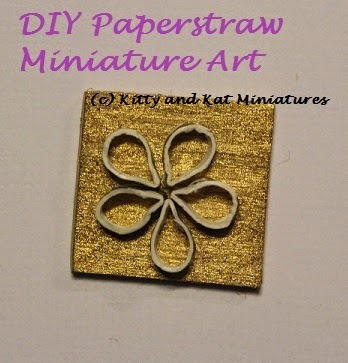 Then glue them to a wall in a flower and vine motif. Not something I would do in my house. But I kinda liked the idea. I cut a 1x1 inch square from my scraps of balsa. Then I painted it gold and trimmed the edges with black paint for contrast. I took small slices off my gold and white paper straw (from Target) and used my tweezer to make a point on the circles (like a flower petal). If you press too hard or have a thin straw you might already have a point made as you cut. Then, I used the Quick Grip glue and glued them down in a flower shape. The picture doesn't do it justice. It's super zoomed in. 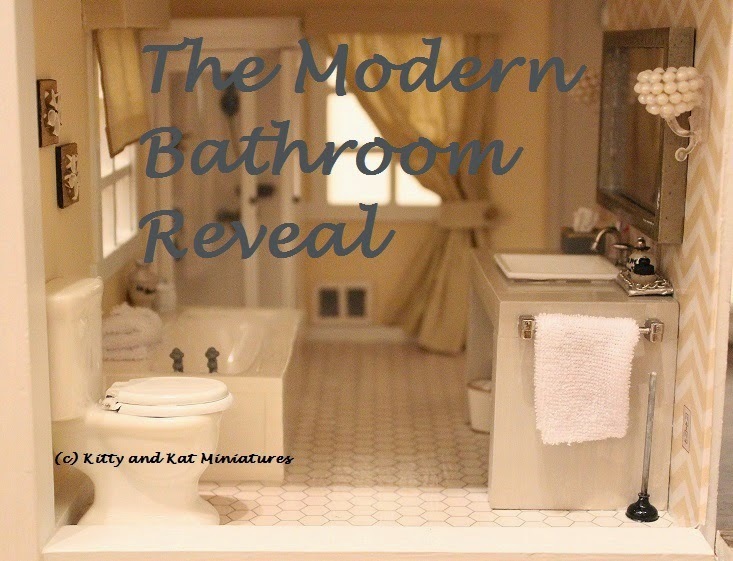 Take a look at it on my bathroom reveal posts. It looks better on the wall. Simple and easy! I needed a bathroom seat. Yes, the toilet is a throne. And you could sit on the bathtub surround. But wouldn't it be nice to sit on something solid and comfortable while you dry off or apply nail polish? Seating was in the back of my mind. As I wandered down the craft aisle of the dollar store I turned my head to the right and caught sight of some (ugly) chenille yarn. Ugly yes, but a perfect colour match for rattan! And fine enough for a scale match for a mini. Then, in the kid toy section (after we spotted an Elmo book for Kitty) I saw a small foam block set. 20+ blocks of various sizes and colours (but small) for $3. 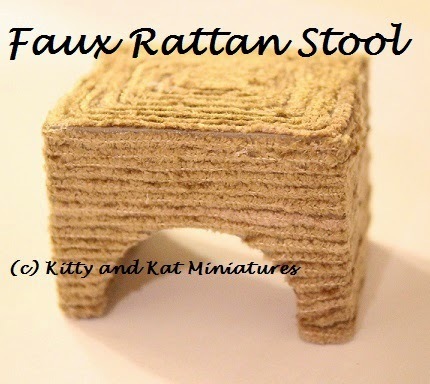 The stool had solidified in my mind (that didn't sound right, but its kinda funny. Poop joke). I shortened the block in height and width. I am still finding orange foam flakes everywhere despite vacuuming. And vacuuming. I then painted the bright orange block to a light beige. Not an exact match to the yarn. but close enough. Not orange. Then, I applied small sections of tacky glue and started wrapping. And there it is! You can see a corner of it in some of my other bathroom pictures. It sits to the left of my vanity. Very soft to touch, but firm. These foam blocks are going to get well used in the months to come. Lighting is always key to a room. Since I have a non-electrified dollhouse I just need them to look pretty! The big bathroom mirror was calling for 2 sconces on either side. I was fortunate that the beads I chose actually pull apart in rows, I discovered this as I put it in the vice and had my saw to it to take the top quarter off. The little bumps are actually in circles stacked on each other. I pulled 2 rows off and revealed a top hole. Perfect! I cut off the little plastic "arm" on the organizer clips to have a smooth back plate. When I did this the first time I had no intention of using the leftover arm. Then I looked down at in on my bench. It was the perfect decorative arm support! Winner winner chicken dinner. This picture better illustrates the arm from the plate. I took the bead and glued it to the top half of the clear backing plate. I then took the plastic arm and inserted the end WITHOUT the ball into the bottom of the bead, and glued it. Then glued the arm to the plate. I then took my gold pen marker and painted the inner circle of the bead since it was visible. As you can see from the title picture its pretty simple to put together. You can use any bead you like. Its all about the plate and the arm. I know the 3M Cord Organizer Clips come in small, medium, and large so you can adjust it to your needs. But I really like the clear backing plate part because it can be used in countless applications. 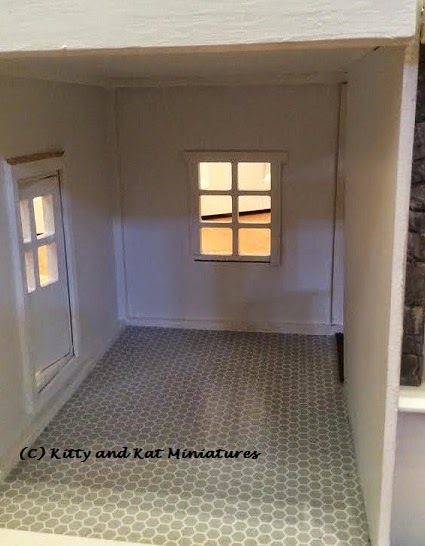 Ah, so busy working on my wee kitchen that I haven't composed a recent post! Today I made a really cute floor to ceiling blackboard for the kitchen. I just need to get some matte finish spray paint to seal it. So excited! The Printies I used, well, I didn't scale them the best I could because I was tired. Too tired to go upstairs, defeat the baby lock on the cupboard and sneak out a tube of toothpaste in silence to figure out the proper dimensions. It looked close enough to me! The medicine printies are from a photobucket site that I had pinned on Pinterest. The soap is from the Chrysnbon bathroom accessories kit. The tray is a few pieces of scrap balsa with some tinfoil on the bottom for shine. Here's a tin foil story. I saw these shiny metal sheets at the dollarstore in the craft aisle. I thought, cool! shiny sheets!! Did I notice that it was made by Renolds, the aluminum foil people and put two and two together? No. So I essentially bought sheets of aluminum foil. Shaking my head. The bathroom plunger and trash can are from the Chrysnbon kit too. I painted both. To fill the trash can I used scraps of paper and tissue. But too make my life easier I filled the can half way with wax from a tea candle. Just tapped it down with the end of my craft knife. Gave it some weight and it required less filling AND provided a surface to glue to. The towel I stole from Miss Kitty's wash clothes. I needed white terry cloth. But I wasn't even thinking about using them until I was putting her laundry away (the same week I was finishing the bathroom) and had a light bulb over the head moment. She no longer has any white wash cloths. Sorry kid. The electrical sockets and light switches are from Small Stuff's Print Mini. They have 3 colours to choose from. 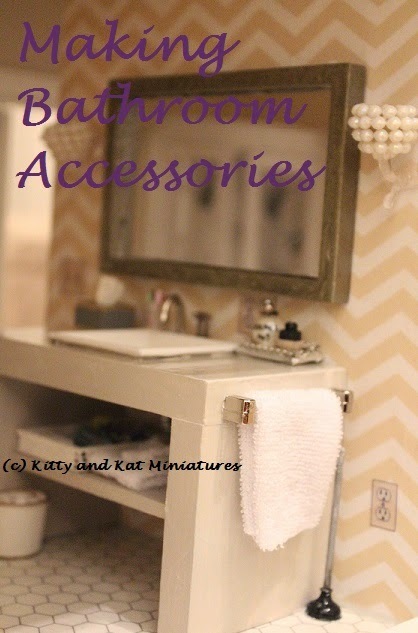 What I have added is a baseboard along the vanity wall. It finally arrived in the mail from China. My Amazon purchase. The bathroom accessory tray was a 1/16th scrap of balsa that I wrapped in my fancy aluminum foil. I then used some scrap necklace chain to trim it. The Chanel No.5 bottle is a bead with findings and a long metal mini nail going through it and into the tray (along with being well glued). I wrote on it with the little metal pointed poker that came with my craft knife (aka a scalpel). The black topped bottle is a wood plug or the legs you use on miniature furniture. Just a bead and nail through it too. The toothbrushes are from the Chrysnbon kit. The cup is the eraser cap from a mechanical pencil. I also packed the cup with wax so the toothbrushes sat higher and could be secured with glue. The tissue box was a 1/2 inch wood cube from the craft store. I cut about a quarter off of it. and I drilled 2 holes into the top and connected them with a little carving. Then I glued in tissue. Painted, it looks pretty good. I am a total sucker for the items in Restoration Hardware. But I only buy when its on sale, or hunt for knock offs. So, I made my own knock off of their "Le Bain" line with a Houseworks Finial. The other jars are just beads. I am a sucker for details. I stared at my bathroom and realized I needed not only light switches and plugs but I needed a vent too! This one is made from scraps of balsa that I planed out very thin with my knife. I glued the thing to my fingers several times. Swore a lot too. Then I needed some mesh. Off to the dollar store the next day! I found a spatter guard that is intended to put over a round frying pan. So it was big and had fine mesh, bingo! And it had a $2 price tag for a lot of mesh....sold! I glued a piece in place and painted it to match. Word to the wise, paint and mesh looks messy. It forms a bubble surface on the mesh. Not the best description, but it leaves paint blobs. I used a dry brush to tap the bubbles and have a clear mesh. And being lazy and not wanting to leave my stool to find black paper, I found some grey 600 grit sandpaper to back the vent with. The pipe is make from a juice box straw. The toilet paper rolls are toilet paper strips rolled on a dowel. There you have it! My bathroom accessories. Nothing fancy but I like it. I am very proud of myself and the first room I have completed. So I apologize for the excessive number of pictures in this post. And it truly is a "done" room, its all glued or nailed down. Literally. Toddler safe. There is enough Tacky Glue, Quick Grip glue, Mod Podge and No More Nails glue in this room to sink a small boat. I am tired of picking it off my fingers every night. The other items are handmade! I've mastered the mini miter box. I will go further into accessories, art and lighting in future posts. Too much to write all in one night. I am picky. I needed to add vents, light switches and outlets. The vanity and mirror were expresso brown. I had to change it. The mirror is now a metallic hammered finish. I had to make a tissue box. Its cold and flu season. I will share where I got my Printies in a later post. Made my own bum wipe rolls! My husband was not impressed I took the straws off the juice boxes for pipes. The faux rattan bench I made. Double light switch for ceiling light and sconces. And there you have it! My first room done. I'll discuss specifics about the vanity items, vent, art and lighting later this week (hopefully).